Life lived well always finds us torn between two places – hope and reality. We’ve hope that things can and will be better but also live in the reality that they may not change in our favor. Yet if we lose hope reality will drive us to despair. And if we lose sight of reality hope will lead us down a dangerous path. We’re to live in this paradox –”being in this world but not of it”. It’s the balance we must have when we’re faced with hardship and the need to survive. When my wife Denise went in for her biopsy seven years ago we prayed there wasn’t cancer but knew that it was possible that the lumps on her breast could be malignant. When they turned out to be cancerous we continued to hope that Denise would be healed but we also lived with the reality that she might not be cured. Hope gave Denise strength to go through chemo, radiation and 7 surgeries. Reality kept her rooted in her relationships with Christ, her family and friends because she just didn’t know how it would all turn out. This combination of hope and reality is what Jim Collins calls “The Stockdale Paradox”. 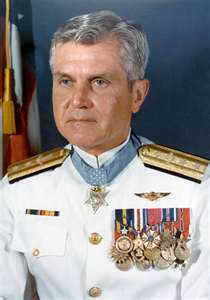 Named after Admiral Jim Stockdale an eight year prisoner of the Vietnam War housed at the “Hanoi Hilton” where he lived in unimaginable horror. This combination of hope and reality, of being in the world but not of it, is where we’re called to live and lead as we face, and help others face, the world before us.